Married in 1995, “Whereas a Bishop can not be married in Orthodoxy”David Kiknadze was ordained deacon and priest. From 1995-1999 he served. It ‘was rector of the church in the town of Surami, to revive the life of the parish operates in many settlements Urbnisskogo-Ruis diocese. In 1997 a priest, David was raised to the rank of archpriest and was awarded the right to wear a cross with ornaments, and in 1998 the right to wear the miter and the second pectoral cross. In 1998, the Rev. 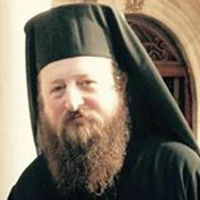 David Kiknadze in 1999 has left the jurisdiction of the Patriarchate of Georgia, passed in the Russian Orthodox Church Outside of Russia, and soon moved to France. In subsequent years, the service performed in a number of parishes in Western Europe.In 2000, the Rev. David Kiknadze graduated from Tbilisi State University. In 2008, the Rev. David moved to the Holy Synod of the Metropolitan Church Calendar fatherly TOC of Greece, which is one of the branches of the old Greek church. That same year he pereshol the Ukrainian Orthodox Church Kiev Patriarchate (UOC-KP), and in 2009 he was appointed dean of the Dnepropetrovsk-Krivoy Rog Diocese of the UOC-KP. In May 2009, the Rev. David was appointed representative of the Diocese of UOC-KP Bogorodsk in Georgia. .In November 2011, the Rev. David Kiknadze on the decision of the Holy Synod took monastic grabbed Daniel denomination, after which the leaders of the Russian Orthodox Church Metropolitan Alexander jurisdiction (Glushchenko) -RosPTs (A) – was ordained bishop of Prague Roman and Western Europe. In his episcopal consecration was attended by the following persons arhirey canonical:Kyriakos(Temertsidi), Metropolitan of Pyatigorsk and southern Russia Alexander (Glushchenko), Metropolitan of Moscow and All Russia Micah (Baraga), archbishop of Ryazan Sergio (Mironov), Mons. In 2010, Daniel (Kiknadze) in the rank of metropolitan canonical joins the Holy Synod of the old calendar and all Greece equation Mass and organized a synod greek! Metropolitan Daniel inside the church and secular law from 2010 is evharischeskom communion of all the churches registrirovonny canonical jurisdiction of th e European and provoslovnogo Church under the omophorion Patriarch Nicholas Primo. blazhnishi Daniel, archbishop of Milan, Metropolitan g Slavic diaspora in Europe, America, Canada, Australia and New Zealand Foreign Affairs predsedalet Italia and vice speaker of religion Parliament committees. President benefactors of religious organizations the name of St. Bartlomiej. The metropolis of the Slavic diaspora is headed by Metropolitan Daniel resides in New York.This metropolinate, part of the Orthodox Church in Europe brings together the clergy and faithful of the Slavic diaspora not residing in their country of origin.His Beatitude Archbishop Daniel, under the authority of His Holiness Patriarch Nicolas administers zealously metropolinate. 1. Metropolitan Michail Mtskheta-Georgia tbilisi e consigliere primo! 2. Dimitrios Mitropolitan per rumania General Vicario in Metropolia diaspora slava.3. Metropolitan Sava Slava per metropolita diaspora. 4 Metropolitan Iakovos of Lima (Peru) 5. Archbishop serafim rumania Gregory 6.Archbishop Brazil 7.arkhbishop Melchizedek Ukraina 8. Bishop Spiridon Moldova 9 .Bishop refayl South OssetiaGabriel 10.Bishop of North Ossetia 11.Bishop Laurenti Abkhazi, Korepiskopo Anatoly first Secretary General diaspora in Slavic Mitropolia slava.